It's Albert from the SGN. We're kicking things off in 2006 with a special blog feature called "Grammy Central", a one-stop information source for all things related to the 48th Annual Grammy Awards. It'll be a place where anyone awaiting music's biggest night can post information about the awards and make predictions as to who will likely walk away with a Grammy. Join me here on January 2 for the first Grammy topic, a look at this year's nominees in the Rock categories. Until then, have a great time ringing in the New Year! Be safe and please don't drink and drive or let any of your friends drink and drive. 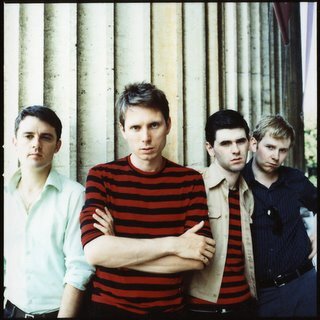 Pictured: Grammy nominee Franz Ferdinand, photo courtesy of Domino Records.